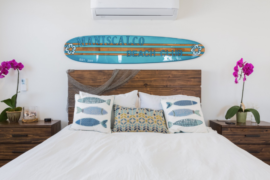 Miami is the ideal spot for beach bums who love the surfing vibe, so why not book a beachfront Miami Airbnb? 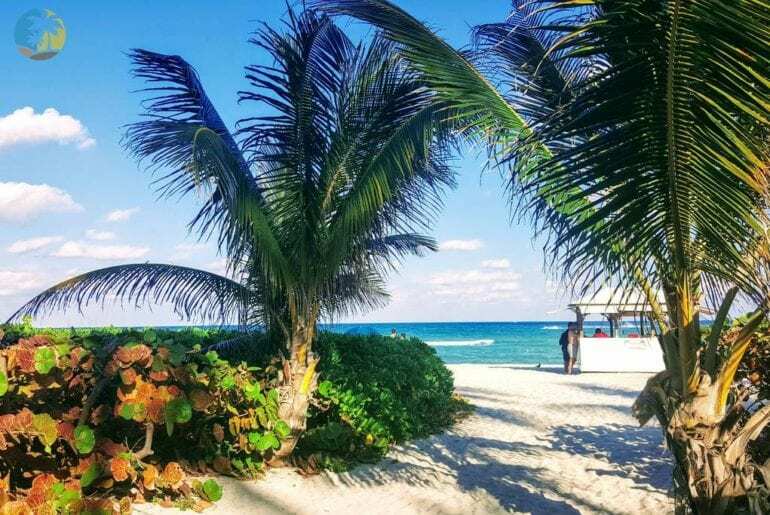 Think about it: you’ve got city life, vibrant nightlife, diverse food, and fantastic shopping, but you’ve also got those gorgeous, white sand beaches right in front of you. 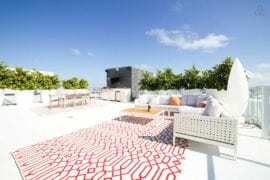 Who doesn’t want to spend their days lounging on South Beach? Whether you choose to don the famous rollerblades to zip along the beachside promenade or not, this is one of the most iconic and glamorous beaches in the country. 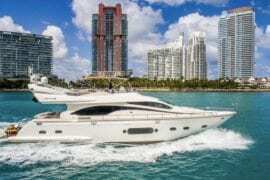 Miami is a fantastic place to lounge all day and glam it up at night, so you’ll need a top place to stay, close to everything you need. With that in mind, let’s check out 8 incredible beachfront Miami Airbnbs that are perfect for surfers and beach bums to enjoy. After a long day of surfing or sunbathing, you need somewhere relaxing and chic to lay your head. 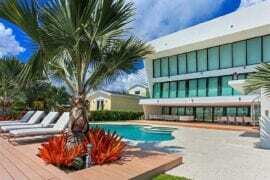 This beachfront Miami townhouse is the ideal choice! With plenty of space for five guests, you and your beach buddies can easily enjoy all the perks of a home away from home with two spacious, beautifully decorated bedrooms and one huge bathroom. The bright, modern kitchen is large enough for whipping up snacks to keep you going until you hit the nearby nightlife, with a huge range of restaurants on your doorstep. Available from $250, this designer townhouse is directly on South Beach’s main road, with windows looking out over the water. You won’t have too far to stumble back from the beach after you’ve exhausted yourself catching waves! 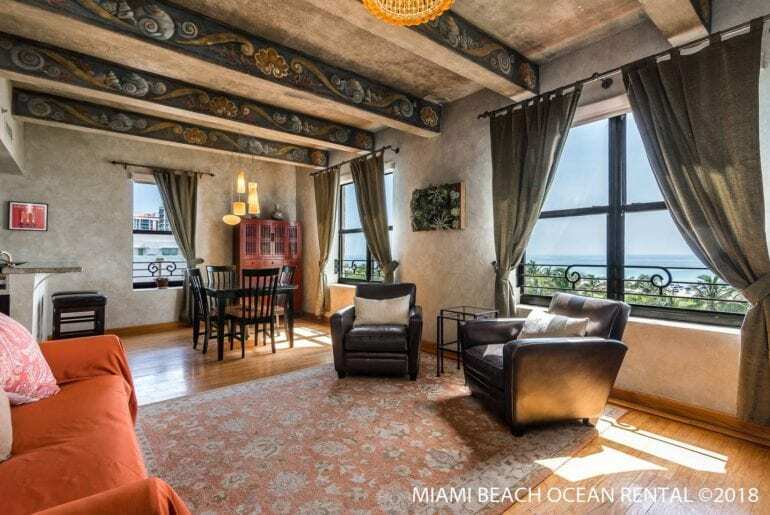 Not all South Beach apartments have to be sleek and super-modern, as this rustic-feeling, vintage condo goes to show. Dripping with opulence and retro style, this apartment has everything you need to relax after a day spent soaking up the sun. With the ocean directly outside your window, you’re never too far from a wave. Rustic wood beams and warm, retro decor make the space feel warmer and more inviting than your typical cold condo. 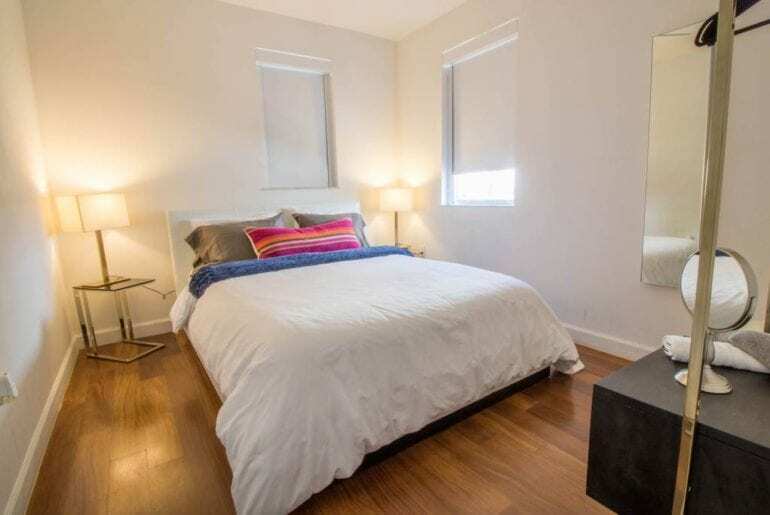 With rates starting from $422 per night, this beachfront Miami Airbnb sleeps four people over two bedrooms, and has a huge bathroom and modern kitchen to complete your needs. The living room is so open and relaxing you’ll never want to leave, but remember, the beach is calling! 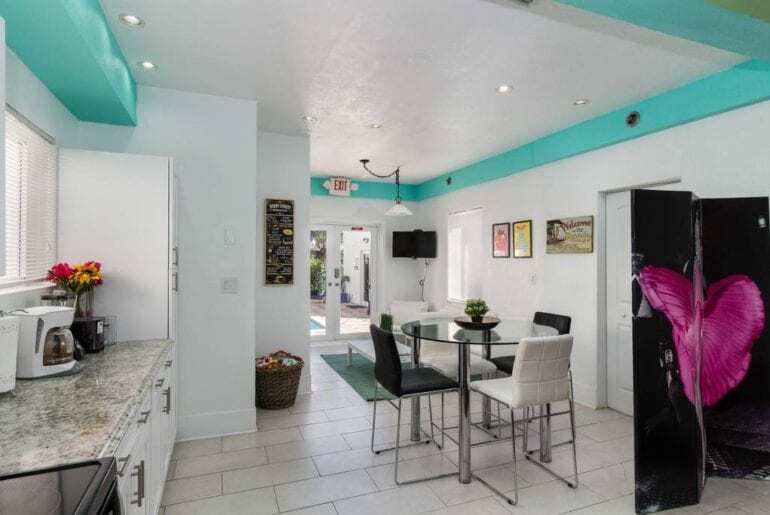 You’re just a stone’s throw from South Beach and its major entertainment hotspots, so you might not use the kitchen at all! 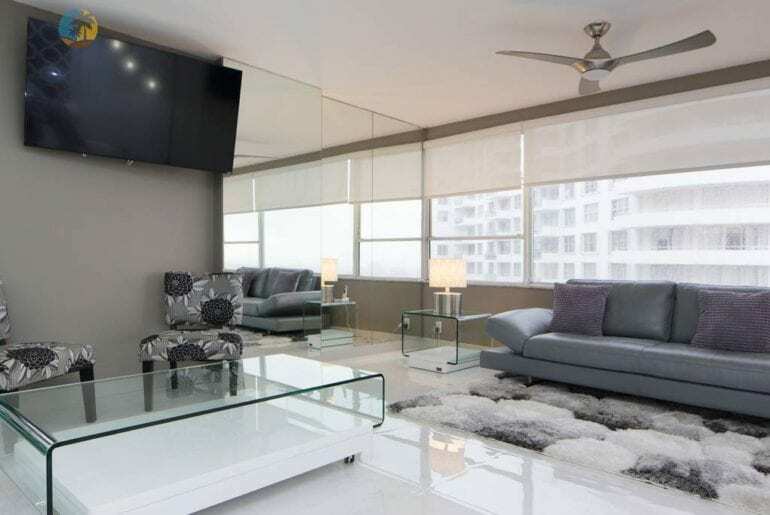 When you return from the beach, you might not want to stop looking at it and in that case, this modern and central Miami apartment is the ideal choice. With direct views over the water, you can venture up onto the roof terrace and enjoy cocktails at sunset, or unwind in the hot tub. 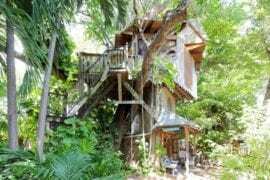 The apartment itself is decorated in a funky, modern style, and sleeps four people with two bedrooms and two large bathrooms. 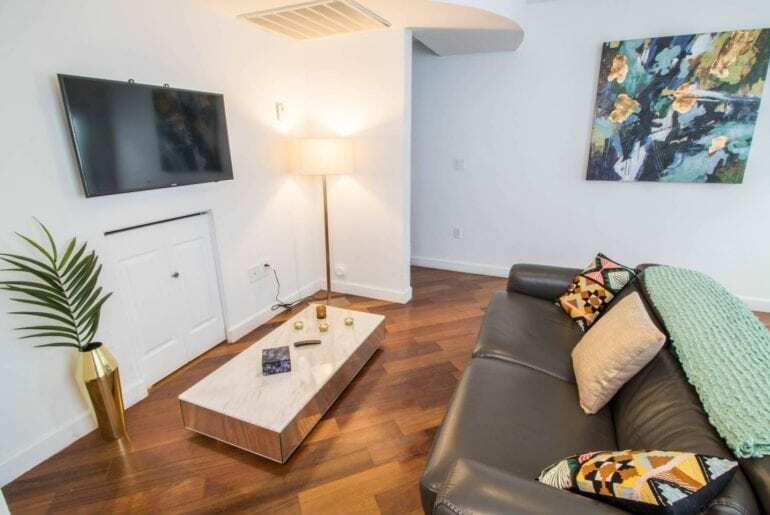 This apartment comes with a price tag of $400 per night, but the location and the excellent amenities are more than worth the cost. 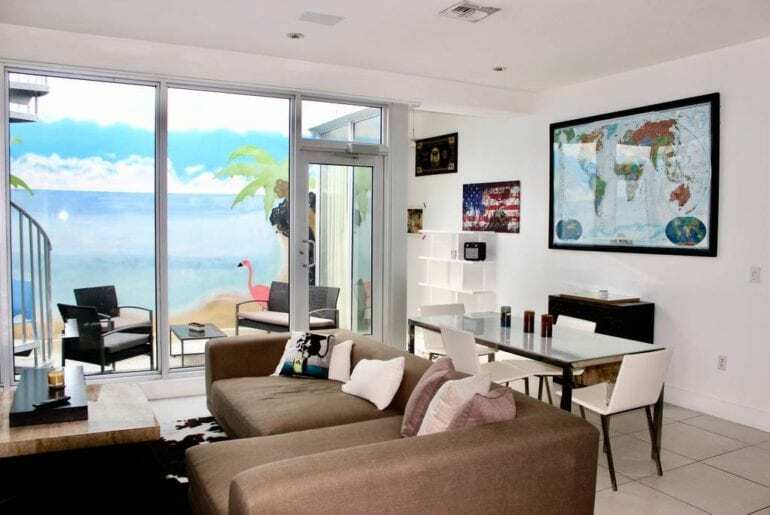 This is one fo the most incredible beachfront Miami Airbnbs for surfers and beach bums because the whole vibe of the apartment suits the laidback attitude of someone who adores the ocean. 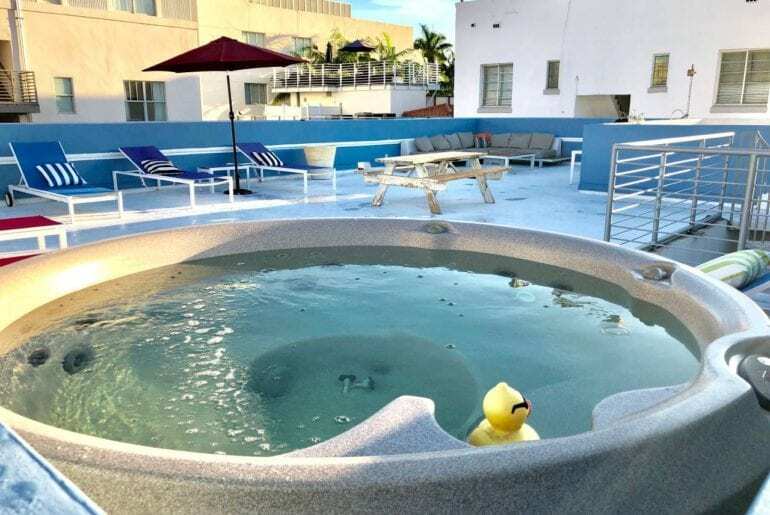 You’re also super-close to all the nightlife of South Beach, but the roof terrace might just hold you hostage (virtually of course) with its captivating beauty. 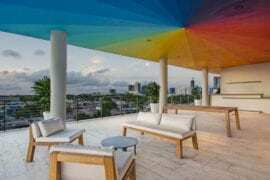 This colorful and modern beachfront Miami apartment is perfect for those who adore the ocean, whether for surfing or simply bumming around on the sand. The onsite swimming pool and sun terrace will give you the option of a break from the beach and serves as the ideal location for a low-key evening with drinks. 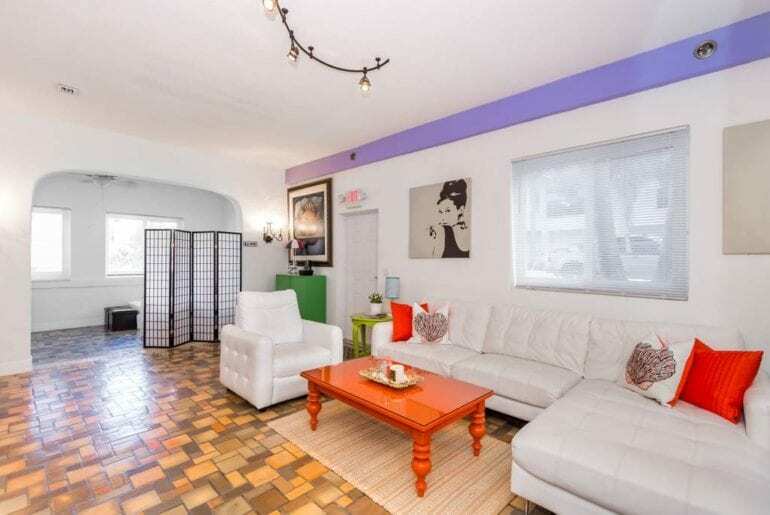 The apartment itself is located steps from Miami Beach, and is decorated in a colorful, contemporary style. With space for up to 16 guests, this is the perfect spot for large groups of friends looking to enjoy the sunny Miami beachfront. 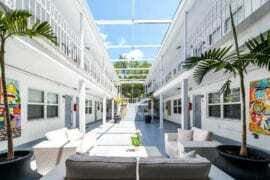 One of the largest Miami beachfront Airbnbs, this one is ideal for a group with five huge bedrooms and five bathrooms. No arguing over the showers here! With a fresh and funky vibe, you’ll love spending time indoors as much as outdoors. This beachfront property is the ideal backdrop for a memorable vacation for a group, with rates starting at $1600 per night. Want to take your next family reunion or bachelor/ette party to the next level? 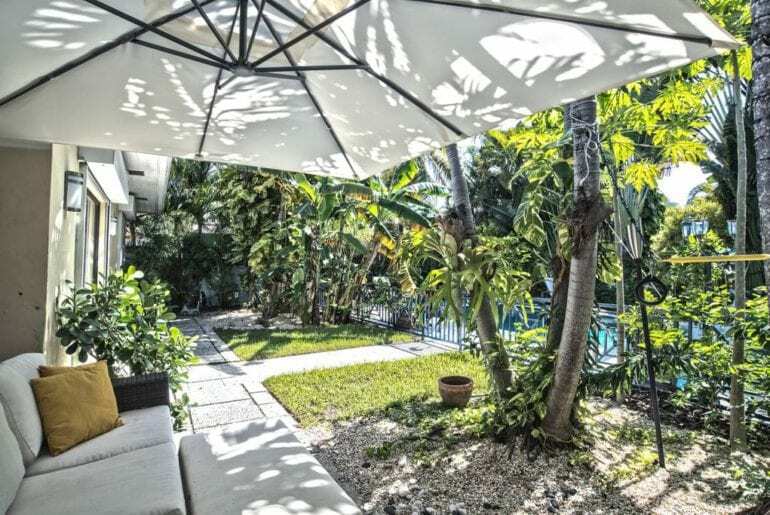 This stunning Miami Beach apartment home is a perfect option for large groups looking for luxury amenities and plenty of space to gather together. Not to mention, direct access to the beach itself! 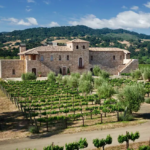 All of this does come at a price, starting at $1,400 a night, but when split amongst friends it doesn’t sound too bad! The apartment sleeps up to 16 people and has so much space you’ll never feel cramped. 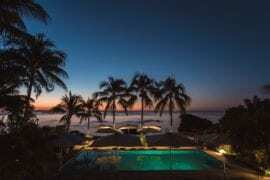 You are a stone’s throw from the beach, with access to a private resort lounge with glamorous Art Deco vibes. 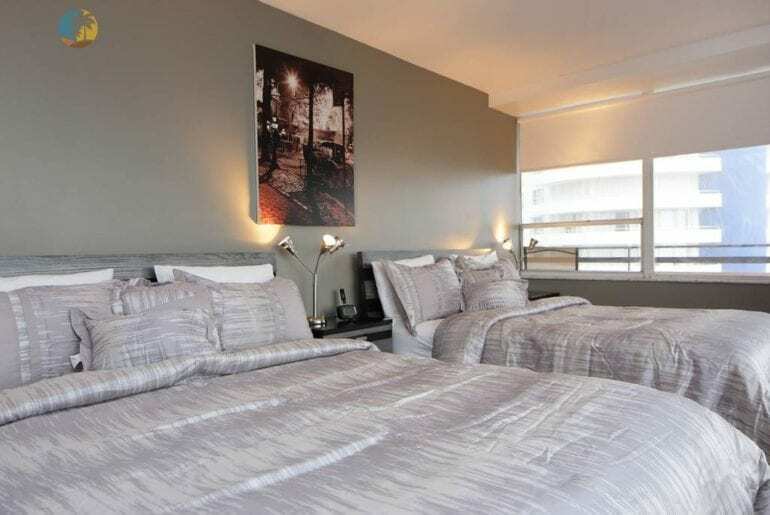 The apartment is decorated in a sophisticated, modern style, with views that will make your jaw drop! 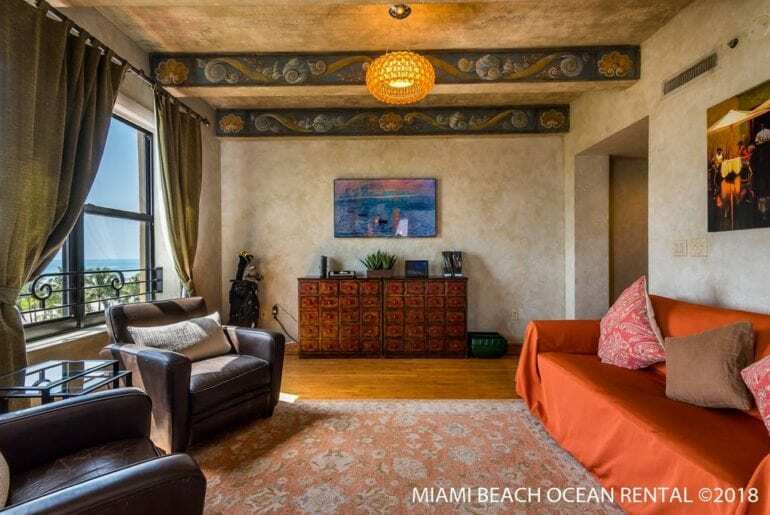 This place is more of a retreat than simply somewhere to stay so if you’re attempting to mark your time in Miami in style, you won’t beat this beachfront Miami Airbnb property. With enough space for up to four guests to stay together, this sleek and modern South Beach apartment is the perfect chilled-out space for beach lovers. Starting at $170 a night, you get high-speed internet and two huge 4K TVs with endless channels. The enormous bedroom suite has beautiful ocean views and a custom closet, so feel free to unpack and make yourself right at home! 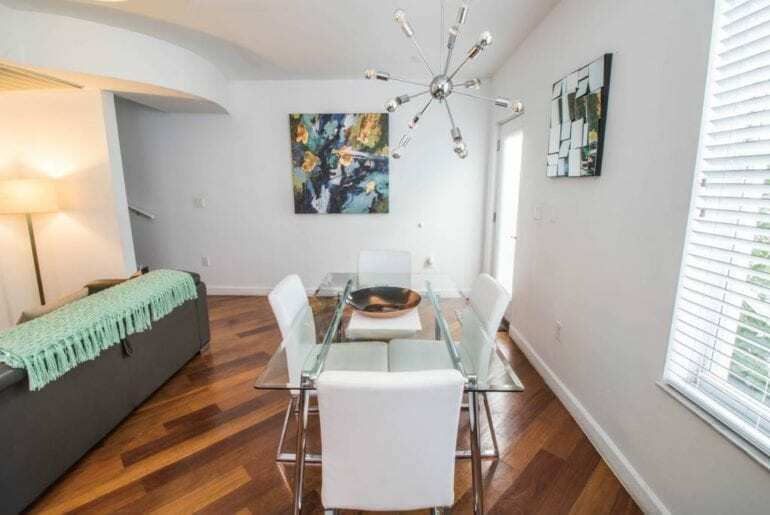 This beachfront Miami Airbnb also has a spacious living area with a sleek, fully-equipped kitchen to one side. This apartment is a great choice for those who want to be right in the heart of the action, with the ability to hit the beach in the day time without any restrictions. The decor is monochrome and neutral, creating a calming feel, ideal for cooling off after a day in the bright sunshine or hitting the sack after a night on the town. 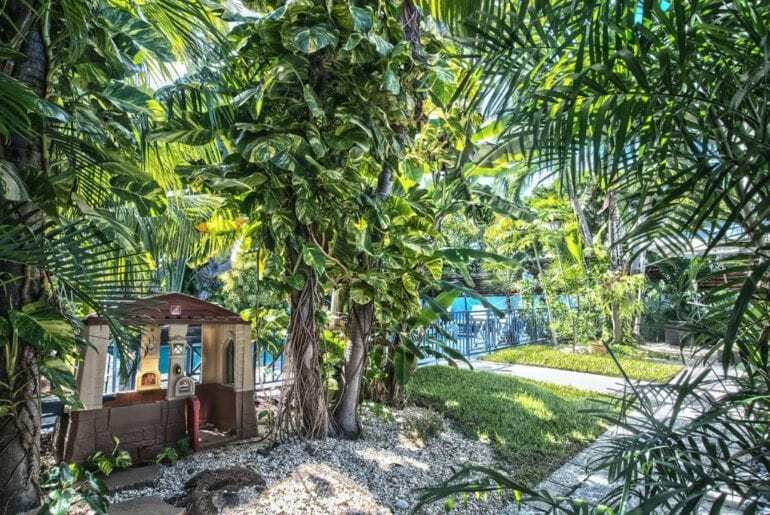 If it’s a family-friendly beachfront Miami Airbnb you’re after, we found the perfect option for you! 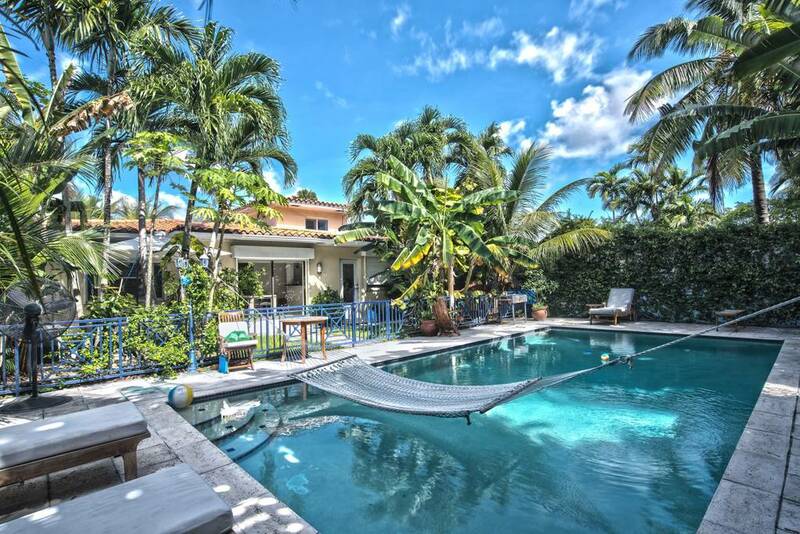 This stunning beachside home with a big, tropical backyard is a warm, inviting place to vacation with kids in Miami. Starting from $210 a night, there are three big bedrooms and two bathrooms, with enough space to accommodate up to seven guests. We love the additional family-friendly amenities like an available crib and a cute playhouse in the backyard. Speaking of that backyard… wow! Lots and lots of lush, tropical landscaping create a truly enchanting atmosphere. There’s plenty of shaded lounge spaces to cool off with a cold drink, but the fantastic heated swimming pool will surely be the place your family wants to hang out! We like that it has a child-proof gate for safety, not to mention the dreamy hammocks that are simply begging you to take a snooze. Located just steps from the beach in Surfside, this family home is perfect for your next vacation in Miami. Now, this is what we’re talking about! 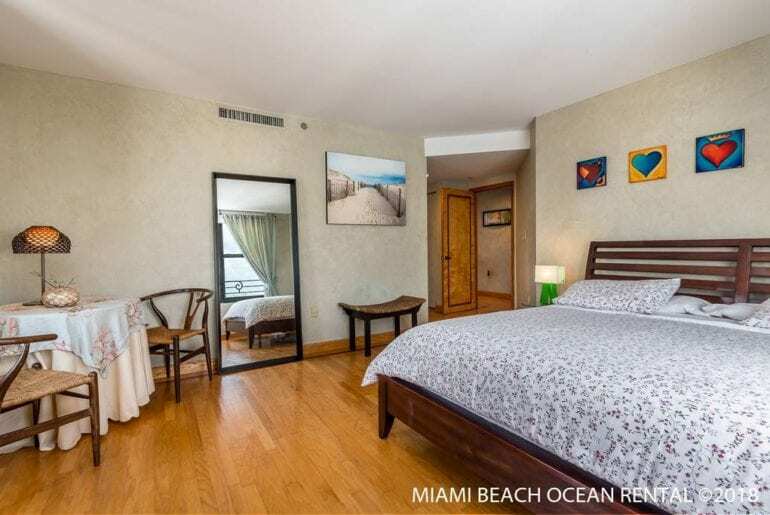 An absolute beachfront condo in the heart of Miami Beach – what more could you ask for? 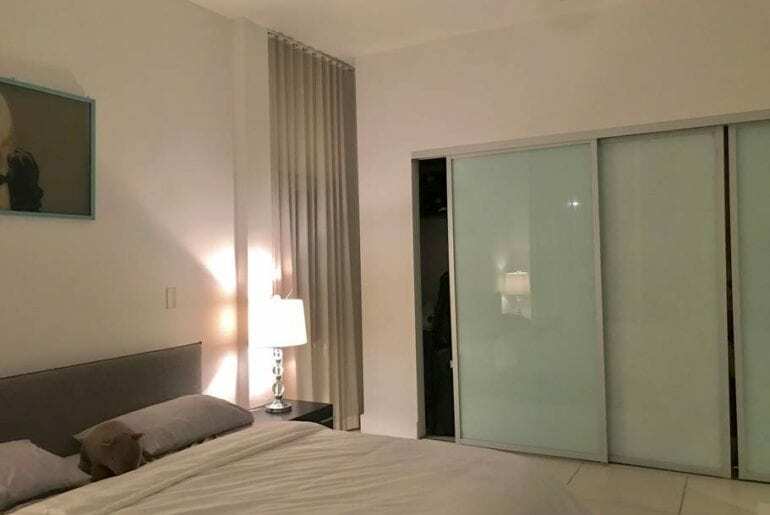 We like the sleek, simple design of this beachfront Miami Airbnb, with its contemporary furnishings and neutral decor. You and your fellow beach bums can unwind here in comfort and style after a long day basking in the sunshine or hitting the surf. 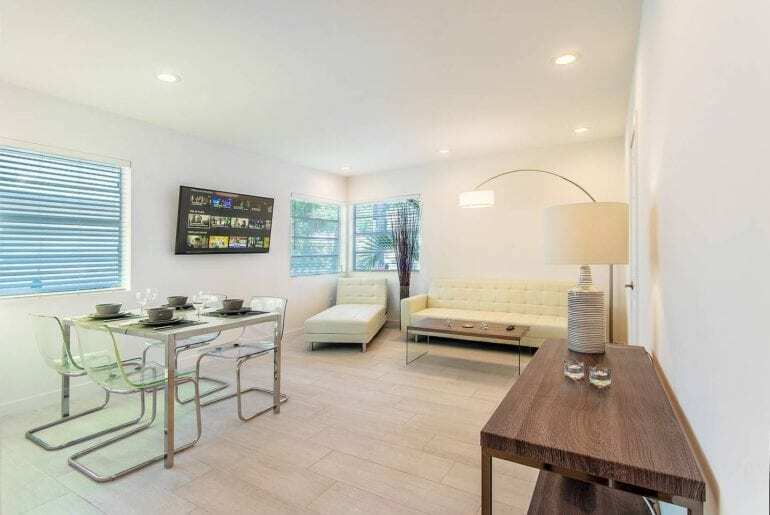 Yes, there’s room for up to nine in this surprisingly spacious, three-bedroom, two-bathroom apartment! 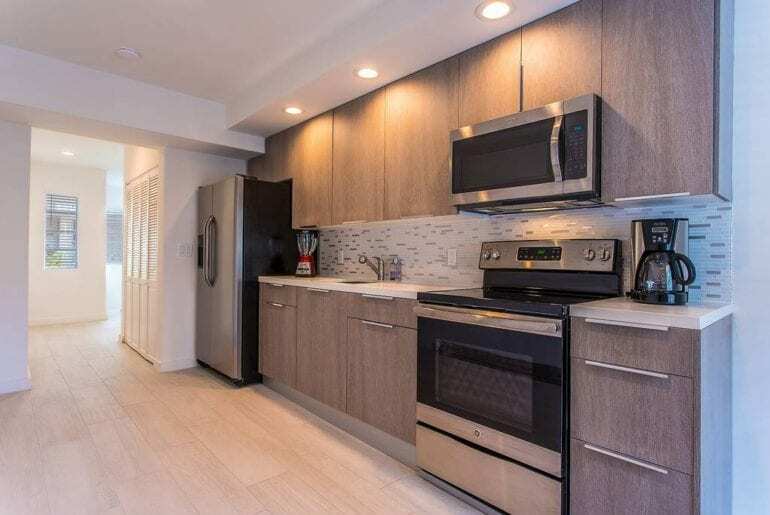 Collins Avenue is one of the most desirable addresses in Miami Beach and this condo boasts easy access to loads of great restaurants, bars, and more. 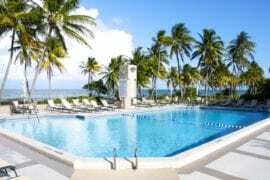 Available from $495 a night, this beachfront condo is a great place to rent for a group of friends looking to enjoy a sunny week or weekend in Miami together.